PADI / SDI Wreck Diver Course (Limited Penetration) is designed for those of us which reached the explorer Level on Diving. 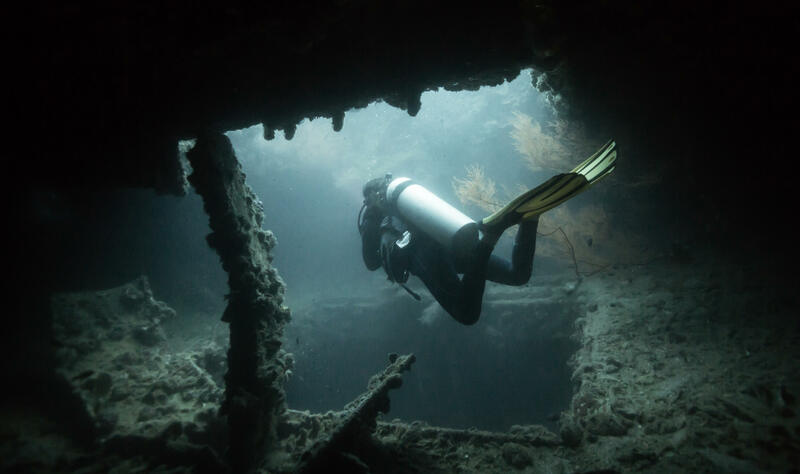 While Diving on a wreck did you ever see that other divers coming out of these Tiny Rooms ? Did you ever ask yourself what are they doing there and what will they see insite a Wreck ? PADI / SDI Wreck Diver Course (Limited Penetration) is designed for those of us which reached the explorer Level on Diving. While Diving on a wreck did you ever see that other divers coming out of these Tiny Rooms ? Did you ever ask yourself what are they doing there and what will they see insite a Wreck ? if you can answer those questions with YES than you will be a Candidate for a Wreck Course. Learn to penetrate wrecks safely and explore the inside. After obtaining this specialty you will be able to explore these fastinating and exciting chapters in maritime history safely. This PADI | SDI Wreck Diver Course (Limited Penetration) is just the beginning of the adventure. We offer also a great Package which includes Deep,Wreck and Nitrox have a look and continue your education with Chang Diving.